Although we was a bit tired from walking non-stop inside the VaticanMuseum – well… I was tired and kinda hid my painful ankles – we decided to see the Colosseum as well. We took metro line A from Oktaviano to Termini station and changed to metro line B to Colloseo. We arrived there at about 4pm. 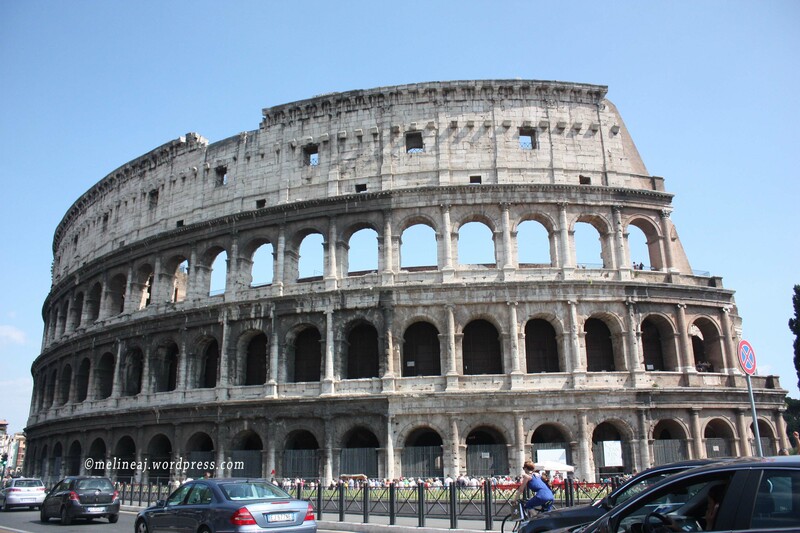 Once we step out from the metro station, we immediately saw the mighty Colosseum across the street. For me, it was one of the moments that I really felt that my dream finally came through! The Colosseum was so REAL! As cliche as it sound, it was a feeling that made me humble. As a child, I used to learn 7 wonders of the world through history book and internet and I am always amazed by ancient artifacts, especially Colosseum. I couldn’t really understand how the ancient Romans were able to build a such huge structure with limited sources, but seeing it with my own eyes made me more appreciate one of the greatest Roman architectures. The line up to buy entrance ticket was not too bad, about 10-15 minutes. The entrance ticket is €12 that includes the entrance to Colosseum and Palatine Hill (Roman Forum). Passing the entrance gate of Colosseum, we took a steep staircase to reach the 2nd floor. 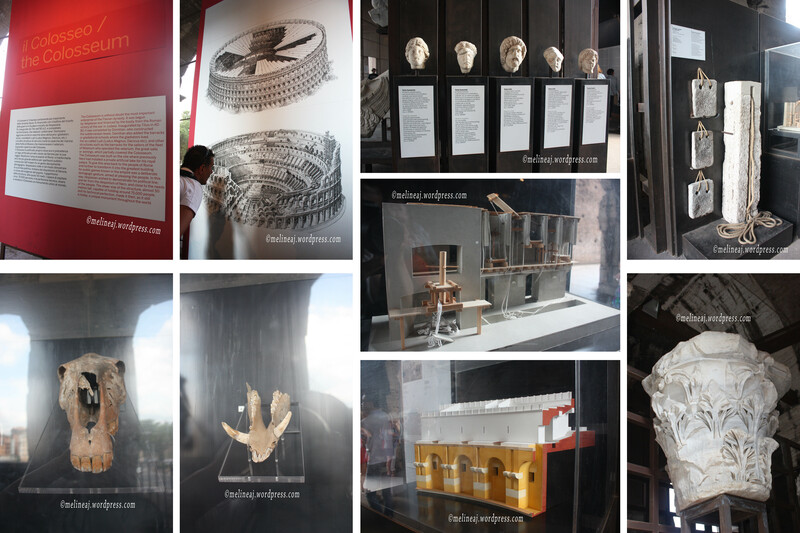 There was an exhibition displaying the history of Colosseum and how the Romans built it. Going out to the balcony area outside, we could see the lower level of the Colosseum where the gladiators fought. This area was closed to general tourists, unless you book a guided tour which take you downstairs on the fighting area. We circled the Colosseum upper balcony and took some pictures to commemorate this iconic site. We then went down to the 1st floor and exit out toward the Arch of Constantine. We spent a good 1.5 hours to explore the mighty Colosseum since the Roman Forum closes at 7pm! The steps staircase were steep! Although we saw there’s a pathway of Roman Forum’s back side across the Arch of Constantine, we decided to walk west along Via di S. Gregorio toward the entrance of the Roman Forum that was about 200 meter west of Arch of Constantine. To start our exploration, we followed a small pathway up just before Acquedotto Claudio (#21 on the map). This led us to an area where we could see the Stadium on the west side (#25). At the right side of the stadium, you can visit Domus Augustana (#26), Museo Palatino (#27), and Domus Flavia (#28). We skipped this area and instead walked toward the other end until we reached Arch of Titus (#14). When facing the Colosseum, you can see Antiquarium forense (#15) at the left side of the arch (the red brick building with a tower). This was used as a monastery but now, it’s a museum. If you walked at this direction, you’ll be back at the Colosseum. 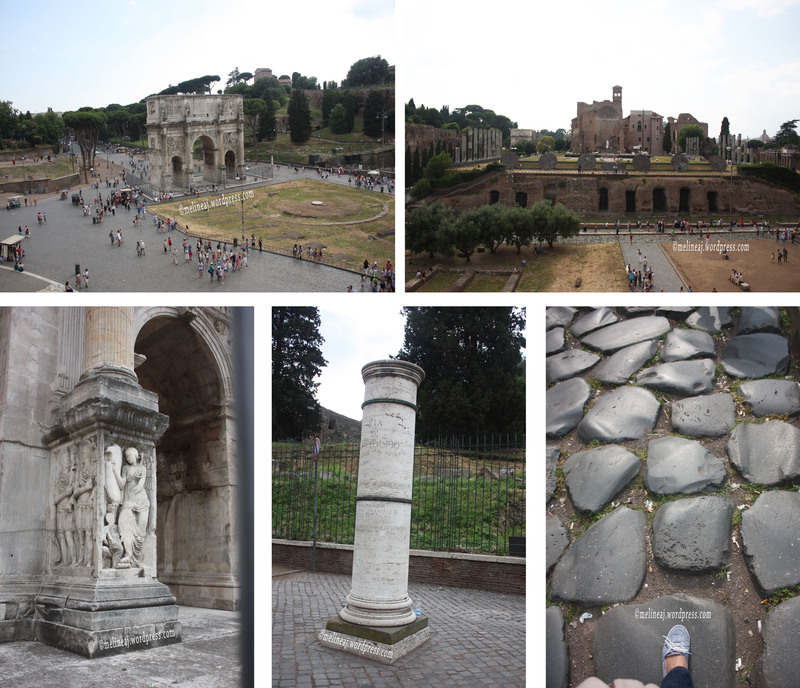 However, we decided to walk toward the other direction (Via Sacra) – to the further back of the Palatine Hill. 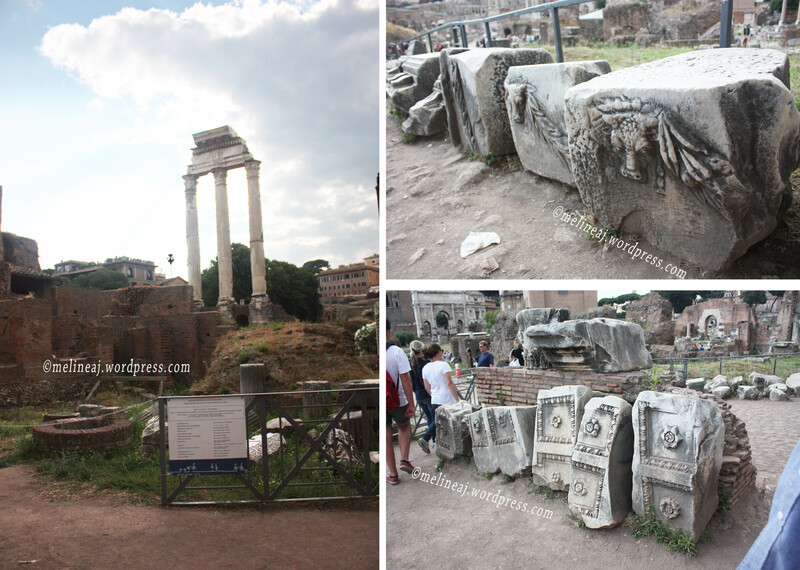 We saw more and more fragments of the Romans\ artifacts laying around the ground – I guess Romans left them in natural state to give a feeling how ancient the Palatine Hill is. 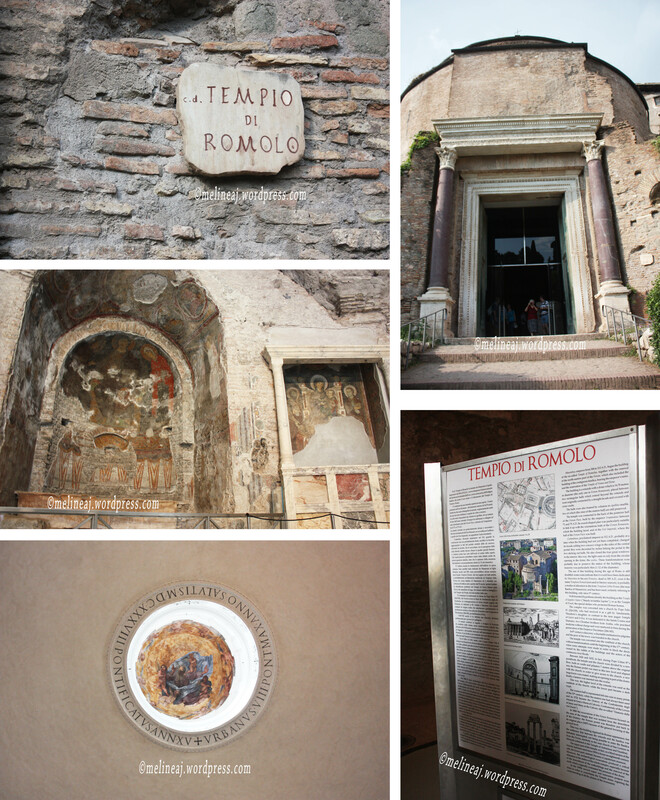 Along Via Sacra, we entered Tempio di Romolo. There is not much restoration work inside this old circular temple. The faded painting and the cracks on the wall were left as is while the back of the temple was gated. Next to it, Tempio di Antonino e Faustina (#10) stands. We then took a left turn to take a picture of the iconic 3 white tall pillars that were left from the original ruin of Tempio dei Castori (#8). We then passed the remains of Casa delle Vestali (#12) that was used to worship goddess in the ancient time. 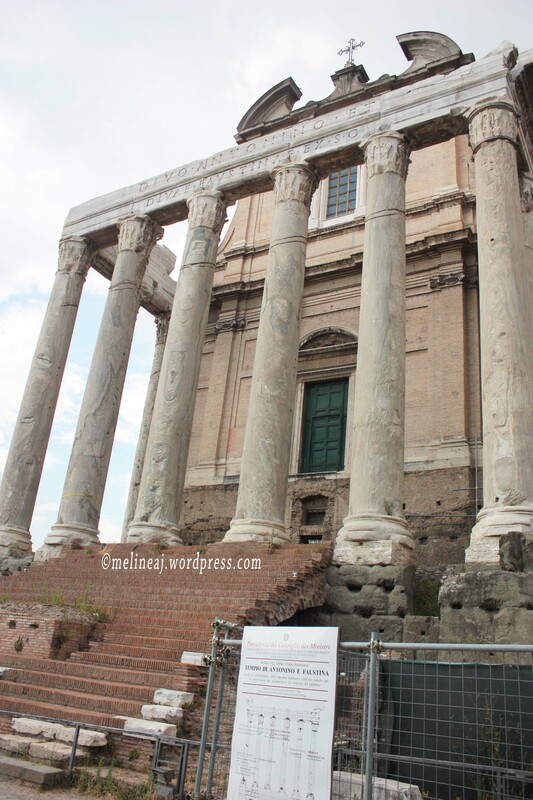 At the rear of the Palatine Hill, we saw Colonna di Foca (#4) and Arch of Septimius Severus (#3). 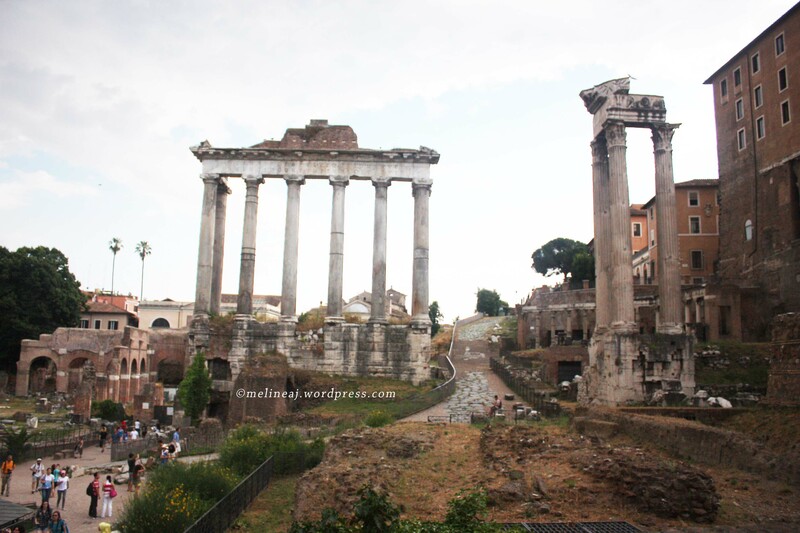 On the opposite side of Colonna di Foca, we saw the seven pillars remains as part of the porch of Tempio di Saturno (#2) and the three pillars as the remains of the Tempio di Vespasiano. Tempio di Vespasiano marked the end of the Palatine Hill. 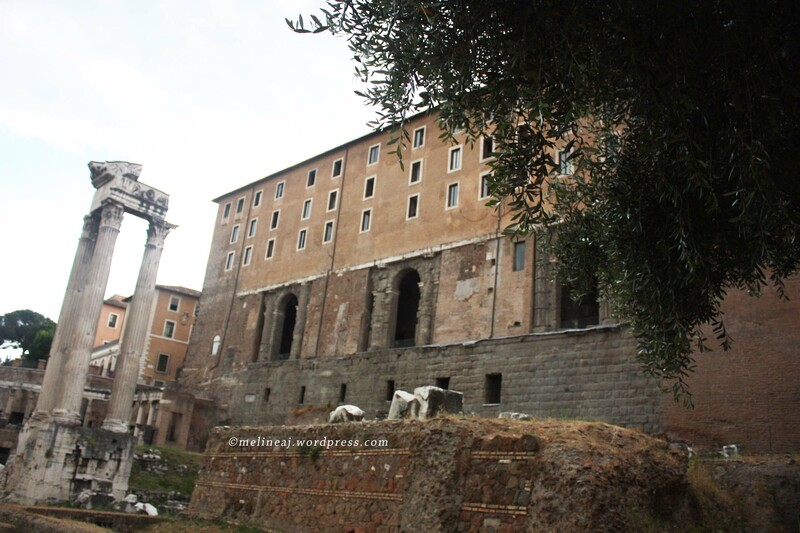 Behind the ruin, Palazzo del Senatore stands on Capitoline Hill. This building is now served as Capitoline Museum. At 6 pm, they announced that the Forum will be closed in 15 minutes! And this annoying announcement was played every 5 minutes! Yeah yeah… we get it… Thank you! *sarcasm* We left the Forum via Campillo exit that closed at 6.15pm. There are actually several exit points throughout but it happened that we were close to Campillo one. This exit led us to the side of Il Vittoriano and Piazza Venezia. On the way up, we passed several old buildings and ruins. It was just amazing that after all these years, the Roman Forum still stands witnessing the world change. We also visited Trajan’s Column and took a snap in front of Santa Maria di Loreto church at Quirinal Hill, north of Roman Forum. Since we arrived at exact time when Pantheon closed the day before, we decided to go there again on our way back to the apartment. 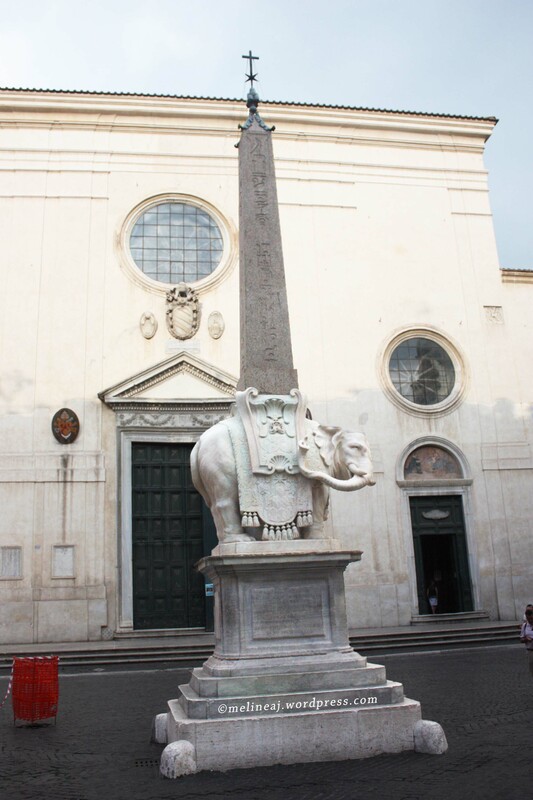 A block prior reaching Pantheon, we stumbled upon an elephant obelisk in front of Santa Maria sopra Minerva church. The elephant was actually the work of Bernini, the famous Italian sculptor. Sound familiar? Remember Dan Brown’s Angel and Demon? 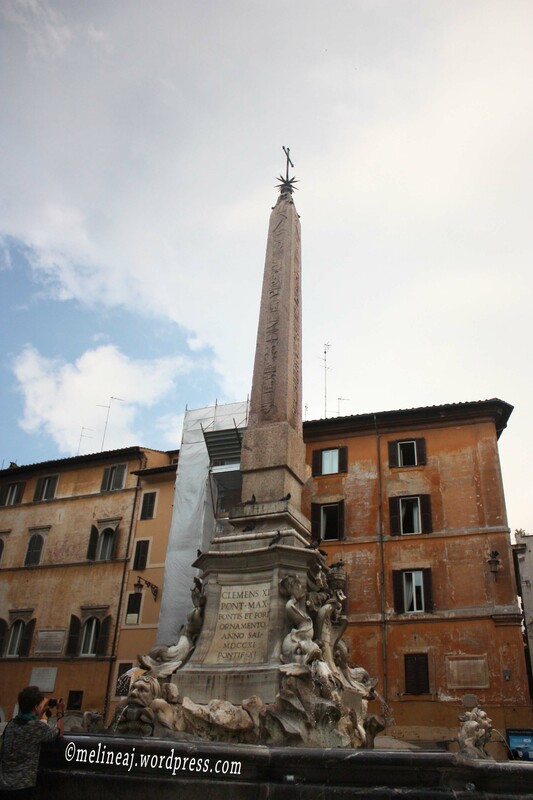 Bernini is the creator of Ecstasy of Saint Teresa statue among his other remarkable works (including the Fontana dei Quattro Fiumi in Piazza Navona and St. Peter’s Baldachin – the high altar inside St. Peter’s Basilica!). Along the way, we saw interesting shops, such as a deli shop that hangs ham from the ceiling and a shop selling pastor outfits and ceremonial uniform. And Italians do love their moka coffee pot! 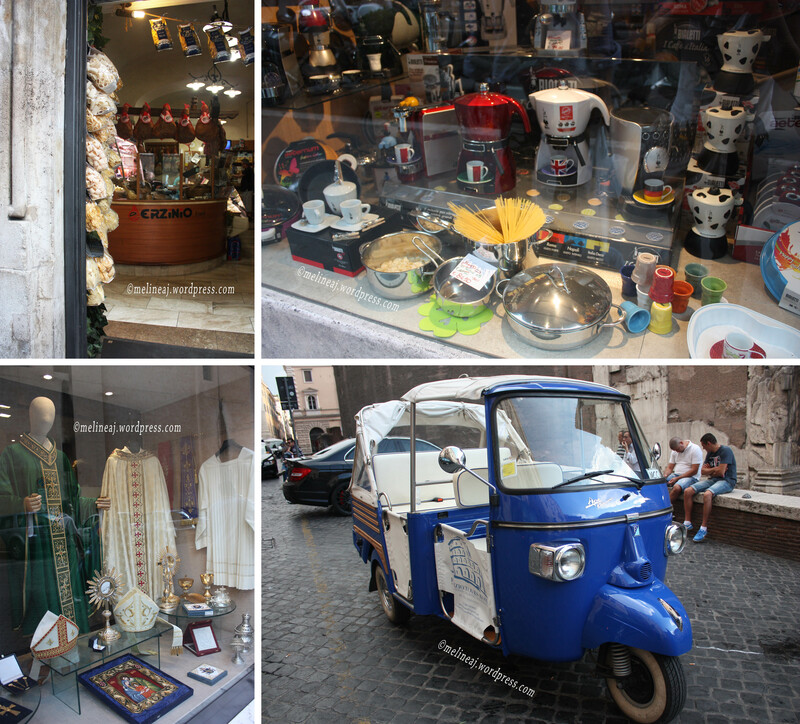 There were some shops that specialize selling the coffee pots and accessories. Oh! And don’t forget the cute blue vespa taxi! 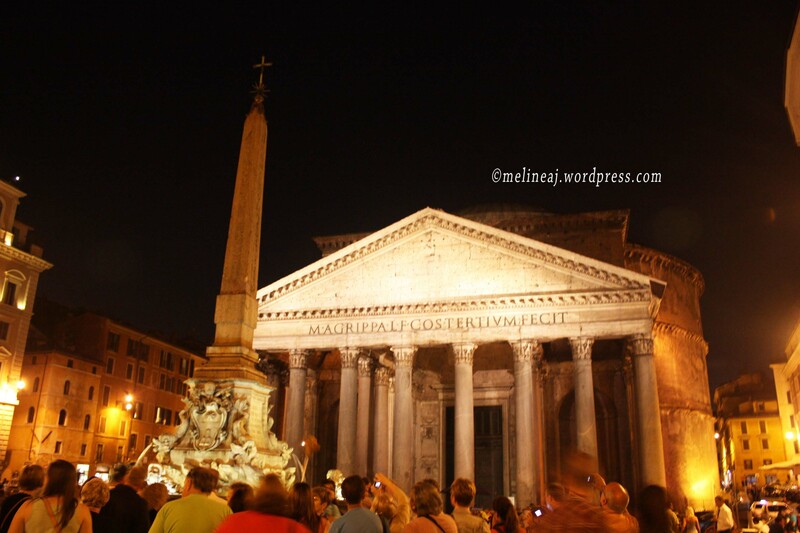 We arrived at Pantheon at about 6.20 pm! Yay! hahahah…. Since it’s free and not too crowded, we marched inside immediately.The most striking thing inside the Pantheon was the dome and its oculus. The material and its structure were meticulously planned that make Pantheon as one of the most preserved building in Rome. Pantheon was built as a temple to worship ancient Roman gods. Since the 7th century, it was converted into a Catholic church known as Santa Maria della Rotonda (St. Mary and the Martyrs). Pantheon also serves as tombs including the tomb of a famous Italian painter, Raphael. The interesting thing about Rome is that the city is very religious (the Vatican – the centre of Catholicism- is right in the middle of the city!). On the other hand, it also believes in paganism as a way to celebrate certain Roman culture. It’s very similar to a lot of Chinese descendants who believe in Christianity. Lots of them still celebrate Chinese new year and others Chinese traditions although some may contradict the Christianity belief. But hey, who can say no to money in the bright red pocket during Chinese new year! hahaha…. Since we had no idea where to go, we just walked following where the crowds were. 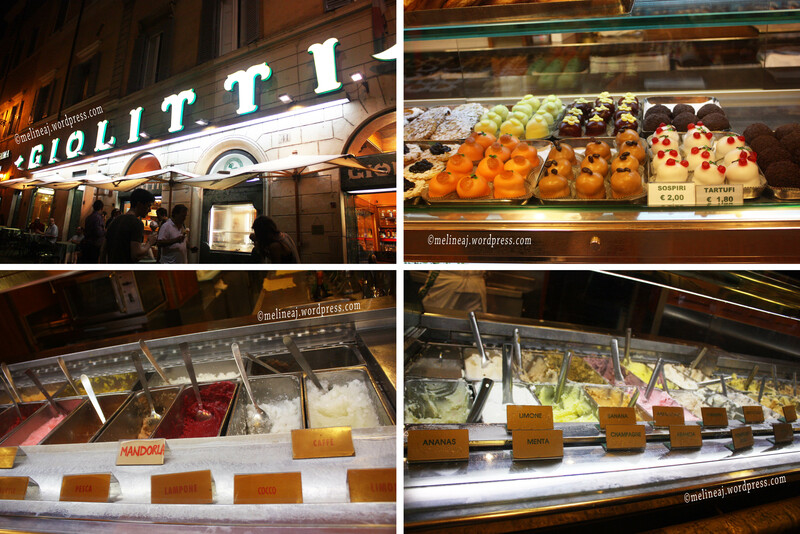 We found Gelateria della Palma, a gelato shop with 150 flavors! They also sells unique candies and chocolates shaped as flower bouquets. I must confess, I haven’t told you that since we had Grom gelato on the day before up till that night, we already had 4 gelatos in between! hahaha… Yes… Italian gelato is nyumiiii…. By the time we were at Gelateria della Palma, I wasn’t really want to have another one.